Leo is a one and a half year old orange and white cat that lives with Karen and Justin. Leo went around the corner into the backyard of a neighbor and, for whatever reason, climbed the very large oak tree there where he got stuck. 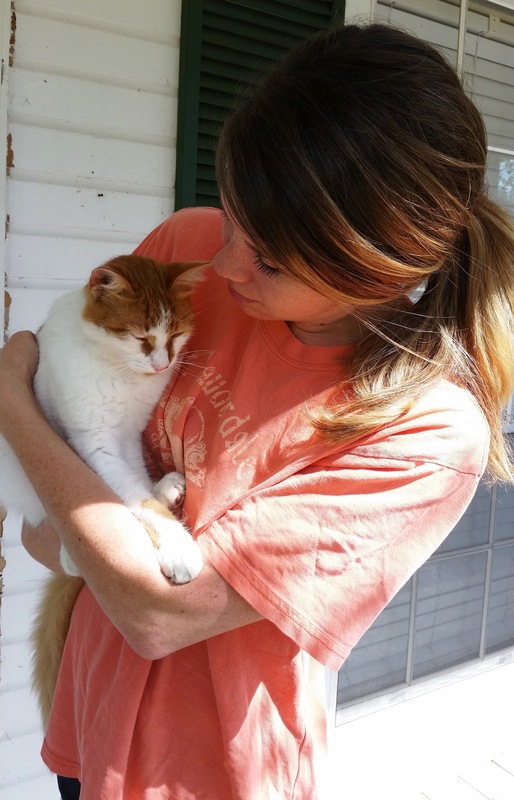 It took a day before Karen and Justin found him, and when they did, they called me to see if I could get Leo down. It was late in the afternoon, but since he was described as a friendly cat, even to strangers, I thought this would be a quick rescue and decided to go on out there right away. When I arrived, I found Leo about 35 feet high in a very tall and large water oak tree with very large branches. Leo was crying for help. 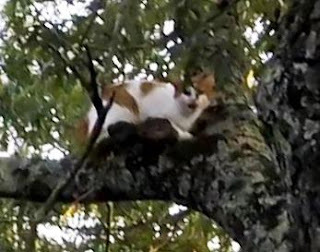 With a friendly cat and a tree that is easy to climb, this rescue should go very quickly. I used my big sling-shot to shoot a weighted bag attached to a string up into the tree above Leo. I would use this string to pull my climbing rope into position. As soon as I did this, however, Leo's mood changed. He was clearly scared by this activity. This is common, but it is also common for the cat to settle down by the time I am ready to begin climbing the tree. While Leo settled down somewhat, he remained scared and was very suspicious of me as I began to climb toward him. He jumped down to a lower branch. At first I thought he might work his way all the way down the tree on his own, but he remained on that branch and walked out as far as he could get away from me. This was a very disappointing development for me. This rescue I expected to be quick could turn out to be much worse in a tree with such large and long branches as these. A cat has a lot of room to roam in a tree like this, and they are much more agile and mobile in the tree than I. If I can't make friends with him, this could be a very long rescue. Leo was now far out away from the trunk, and the only way I could reach him out that far is to reposition my rope much higher in the tree. If I had known this from the beginning, I could have set my rope up high while I was on the ground. Now, however, I had to go through the lengthy and tedious process of advancing my rope one or two branches at a time. I advanced up the tree and stopped when I reached about 60 feet. Now I could go down to Leo and set up another rope far out above Leo and get much closer to him. I managed to get myself about five or six feet from Leo, and I thought I could finish the rescue from there. Leo was still out of my reach, but if I could get him to come toward me a few feet, then he would be within reach. I placed my net on a long handle behind him knowing that would motivate him to come toward me. That worked, but it worked too well. He came toward me, but he ran down the branch to get past me as fast as he could. There was no time to make friends with him or even slow him down. He scampered down the branch several feet and then walked out on another fork of the branch far away from me. I followed him as best I could, but this time I could not get very close to him. Again, I tried to place my net behind him to encourage him to move closer to me, but this time he managed to get by the net and go even farther away and well beyond my reach. It was time to concede defeat. It was also getting dark. In a situation like this where the tree is large and the branches are long and the cat is uncooperative, the only thing I know to do is to set a trap for him. Justin graciously retrieved my trap and other needed gear from the truck for me and attached it to my rope so that I could pull it up into the tree. I placed the trap on the cat's branch with the opening facing him. There were two very large burls on the branch, and I had no choice but to place the trap between them. I secured the trap to the branch, but I had concerns about the burl in front of the trap because it would be just below the open trap door. That left less room for Leo to get into the trap without bumping and triggering the trap door closed while he was still outside the trap. To improve the odds, I placed a small dollop of food on top of the burl and another one immediately past it in order to encourage him to keep his head down as he walked under the open trap door. I went back down to the ground, packed up and headed home feeling tired, discouraged and pessimistic about trapping Leo. I did not sleep well because I was so tired and also because I was worried about what I would do if Leo were not in the trap in the morning. I worked on some plans, but I knew that everything could change depending on where Leo was in the morning. The next morning I drove back out to the site, and it was with great relief when I could see Leo in the trap from the road as I drove up. My body was too beat up and tired to go through another round of chasing him around the tree, so I was happy now that I knew I had only to climb up to him, lower him to the ground, and climb back down. That's easy. At least, it's supposed to be easy. I had left my rope in the tree from the night before, so all I had to do was put on my harness and start climbing up. I climbed up to Leo, covered his trap, secured him to the branch above us and removed the straps I had used to secure him to the branch. I slowly lowered him to the ground where he came to rest on top of my excess rope. Except, that was not excess rope. As I descended, I needed to pull that rope up into the tree in order to reach the ground. As I came down, I had to stop frequently to gently pull the rope from beneath Leo's trap without turning the trap over. I was successful in doing so until I was only three feet off the ground. At that point, there was a tangle of rope beneath the trap, and I could not pull it out, and therefore reach the ground, without turning Leo on his side. I did that as gently as I could, but just as my feet reached the ground, the trap turned all the way upside down and the trap door fell open. Leo immediately took advantage of this opportunity to escape. He ran toward the fence to an opening he already knew was there, stopped to look at me with a dirty look, and then ran off toward home. I called Karen to let her know he would be there in just a few seconds, and, sure enough, he showed up, and she let him inside the house. Leo was home and safe and well. I was relieved, but heavily disappointed in myself for all the blunders I made in the process. I left most of those blunders out of this story, but turning his trap over and allowing him to escape was the only one that was essential to the story. Oh well, I do the best I can, and fortunately, it has worked out well so far. After I packed up, I stopped by to check on Leo and Karen which is when I took this picture. She was holding him in her arms, and Leo was perfectly comfortable letting me pet him. Here he is friendly to me on the ground, but in the tree he would not let me get close. That boy acts just like a cat. I have no video of this rescue because my helmet camera got knocked out of position and pointed up too high. This happened again even when I went back to retrieve him in the trap. Consequently, I have very few pictures to show.